I’m gonna let you in on a little secret – I hate onions and tomatoes. *Gasp* I know! It’s not the flavor but the textures. I don’t like chunks in my food and neither does my son. The rest of the family doesn’t mind them – they could take take ’em or leave ’em as long as the flavor is there. If you have picky eaters like us this easy marinara sauce is the perfect solution. The flavor is huge and the sauce is thin and no chunks. Another reason I love this easy marinara sauce is that it’s quick. It’s not one of those all day simmering sauces (unless you want it to be.) It’s ready to serve in 20 – 30 minutes or you can simmer it longer to let the flavor enhance. The ingredients are minimal and cheap; and this sauce trumps any of the store bought sauces on all levels. 1 can of crushed tomatoes, 1 can of tomato sauce (I use Dei Fratelli canned tomatoes) starts the easy marinara sauce. 1 clove of garlic minced, a teaspoon of crushed red pepper and 2 tablespoons of oregano and you’re halfway there. Stir in 1 teaspoon of basil, onion powder, salt, pepper and sugar and you’re almost done… Drop in a bay leaf, cover the pot and heat at medium-low setting for a minimum of 20 minutes and you have your easy marinara sauce. You’ll want to taste the sauce periodically and adjust the seasoning to suit your taste. I always end up adding more salt and a little garlic powder to mine. To make this easy marinara sauce a meat sauce brown and drain a pound of sausage, ground turkey or ground beef. Add it to the sauce before simmering. The sauce is versatile so you can add and remove anything that you choose. It’s a great base for many pasta dishes (like Manicotti!) and a perfect dipping sauce for garlic bread and garlic knots. *Note* Don’t forget to remove the bay leaf! They’re not too tasty when you bite into one. 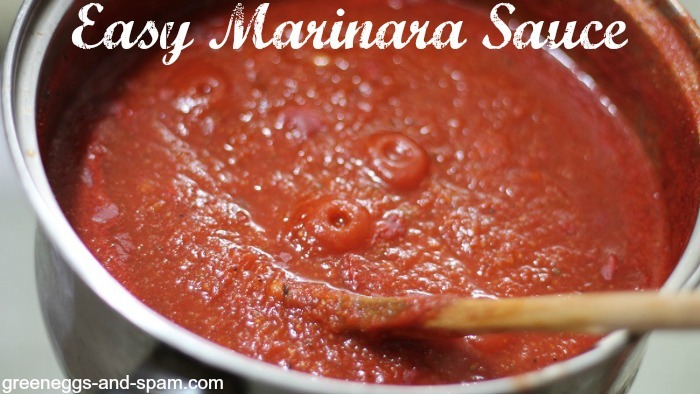 Do you have another recipe for an easy marinara sauce? Add tomatoes to a medium sauce pan and set heat to medium. Stir in the minced garlic, crushed red pepper and oregano and. Stir in basil, onion powder, salt, pepper and sugar. Drop in the bay leaf, cover the pot and heat at medium-low setting for a minimum of 20 minutes. The longer this cooks the more flavorful it will be. Taste the sauce periodically and adjust the seasoning to suit your taste.